Double chins or neck waddles are the result of excess fat or hanging loose skin or both. It is very important to make this distinction as it changes the strategy for what will be the most effective treatment. In the younger patient, it may be a lot of extra fat and not so much extra skin. Older patients usually have a combination of loose skin and fat. At Skin Renewal we offer combinations of non surgical treatments that reduce fat cells and tighten skin such as Carboxytherapy, Titan, Velashape and Exilis Elite. The sooner these procedures are started to improve collagen levels and reduce fat, the better the long term outcome. Men have more skin excess and the facelift incisions that are used in females have to be altered to account for the male beard pattern. Men have a much greater tendency towards some relapse after facelift surgery due to their thicker and heavier skin. 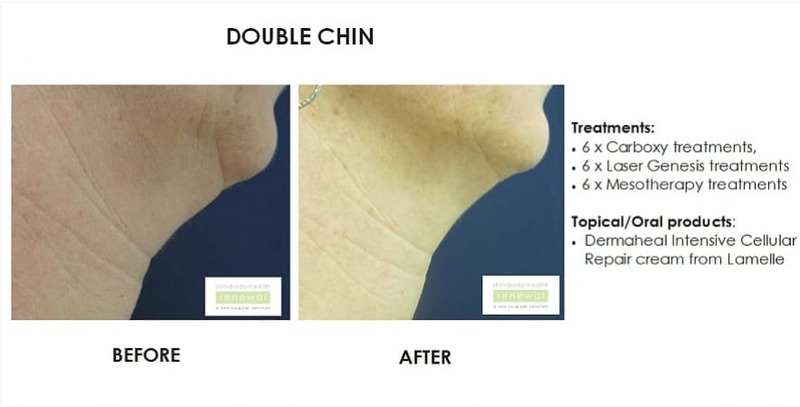 At Skin Renewal we offer traditional therapy (such as home prescriptives that include DMAE and Growth Factors that improve the quality of the skin in this area ) as well as recent advances such as Carboxytherapy, Titan®, Velashape, Lipodissolve, Mesotherapy and TriPollar to treat double chins. As each patient's case is different; we will tailor a treatment program specifically for you and your circumstances. A highly professional team led by a medical doctor assesses every patient and an appropriate combination treatment together with long term maintenance program is recommended. Every client is provided with a fully customised solution dependant on expectations, budget, time and medical conditions. The sooner these procedures are started to improve collagen levels and decrease fat content in the problem areas, the better the long term outcome and anti ageing effects will be. Review -No pain, no gain!! Liezel & Beverley - Excellent, so friendly, extremely helpful and professional!